Dinant is a small pleasant town in the Belgian province of Namur, located in the southeastern part of Belgium. Today the town has become a quiet tourist resort, offering opportunities for pleasant recreation. 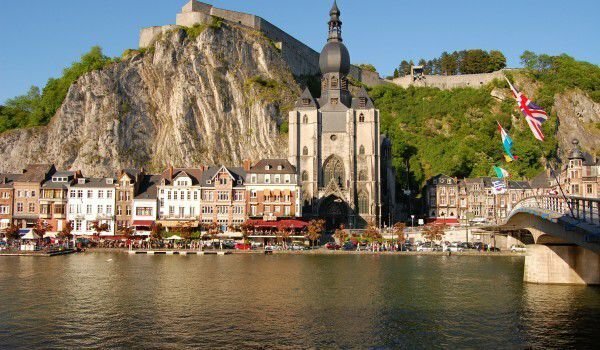 Dinant is situated along the Moselle River, about 25 kilometers south of the city of Namur and is easily accessible from the Belgian capital Brussels by direct train (the town is 65 km south of Brussels). In Dinant now live about 13 000 people. As in most cities in the Region of Wallonia, the locals tend to speak only French and Dutch languages, English is a special honor. Touched by the river Moselle, the panorama of Dinant is dominated by its two most important buildings, and its biggest tourist attractions - the Citadel, which overlooks the city from its 100-foot cliff, and the Cathedral of Notre Dame with its bronze dome. Previous construction on the hill was built back in 1051 on the orders of the Prince Bishop of Liege for protection against invaders along the river. The medieval castle of Dinant was reconstructed in 1530, but completely destroyed by the French army in 1703. Today, inside the citadel is organized a military and arms museum and audio-visual presentation, which may even scare tourists. You can see scenes from life in 1820 - the forge, the kitchen and bakery, even the original stakes of the first bridge at Dinant, built in 1080. In the citadel of Dinant can still be seen the carriage of Madame de Mentnon. She was one of the mistresses of King Sun, which, according to the story, he had a secret marriage after the death of his official wife, Maria Teresa while visiting her in Dinant in 1692. In the citadel are sold various souvenirs, there is a restaurant and terrace, which offers spectacular views along the Moselle. The Citadel of Dinant is permanently open (with a few exception in January and March), entered for an entrance fee of 5 euros for adults. Notre Dame at Dinant was built as a Roman church in the late 12th century. During the 1227 collapse, rock fall destroyed the tower and the church was partially restored in a beautiful Gothic style. A little later was added a large-domed bell tower of the church. During the late Middle Ages Dinant is popular with metalworking crafts. In those years there were produced many religious subjects, some of which can be seen in the cathedral. Besides the beautiful stained glass windows of the cathedral, one is impressed by the huge window that is crafted by Ladon and is considered one of the largest in Europe. La Grotte Merveilleuse is the name of an attractive cave in Dinant, which is celebrated as a "show cave" of Belgium. Its entrance is located about 500 meters from the railway station of Dinan and inside it you can see beautiful waterfalls and stalactites. It is open from April to mid-November daily from 11:00 am to 17:00 (July / August to 18:00) with a € 5 entrance fee for adults. On the promenade is a market. Here is sold almost everything from clothing to fruits, vegetables, olives and souvenirs from Dinant.